13+ years out from my MLIS graduation, a lot of memories about my time at Simmons have started to fade. However, one thing is still very clear: learning how to conduct a reference interview. Our professor (and our textbook) made a big deal of how it isn't the librarian's business why a patron needs this information, and I took that "don't ask why they are asking" admonition very much to heart... for about a month after I started working in an academic library. Don't get me wrong: I still respect my patrons' right to privacy, but making sure they can fulfill the professor's requirements is also a big part of my job. As a result, I've tweaked my reference interview tactics. I don't hit every one of these with every student, but hopefully you'll understand my thinking after you read through this list. "Do you have the assignment with you? It would help me to help you if I could see it." The student who was supposed to pick any painter from the Romantic period but who asked for information about a Renaissance painter? Or that other student who insisted they weren't allowed to use internet sources when really they weren't allowed to use web sources? Saved both of them a lot of time and heartache. "When is this due?" This lets me know if we have time for interlibrary loan, or to request things from other libraries in the consortium, or if we only have time to look at resources that are available right away. "Where have you looked? And it's totally cool if you haven't looked anywhere; I'm just trying to figure out where to start." Yes, I say that whole thing. Sometimes students get so overwhelmed that they can't even talk about their topic clearly, and I don't want them to feel bad about that. If a student has gotten to the point where they're willing to come to a librarian for help, I want them to feel good about it. However, if they have looked somewhere and had no luck, I can sometimes help immediately by pointing them to a different database or even sometimes a reference book. "Can you tell me why you picked this topic?" Here's where I'm fishing for search terms. 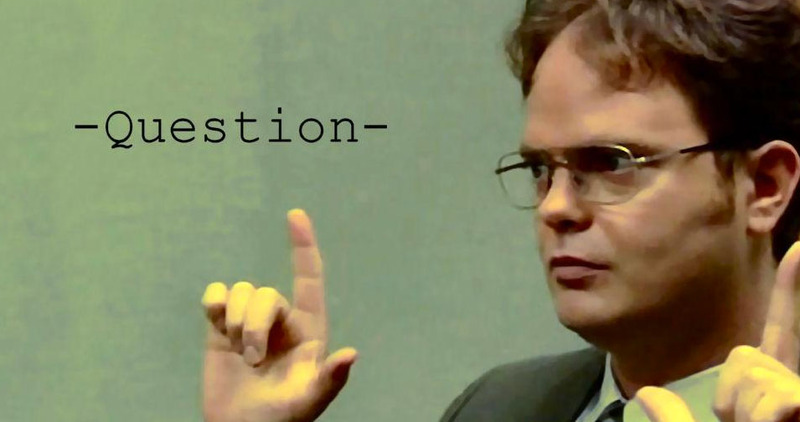 Sure, there are the assignments I've seen so many times before that I know the right words from the get-go, but there are plenty of times when someone working on a senior capstone project introduces me to a brand new topic. And though I know plenty of good search phrases in the disciplines on my campus, I am always learning. "Do you feel comfortable working on this on your own? Do you have enough direction to get started?" I don't typically ask this until I'm fairly certain they'll say they are fine, but I still ask it so they can hear it themselves. "If you need any more help, [how to find me and how long I'll be available]. And good luck with your assignment." I also go back, about 5 to 10 minutes later, to see if everything is still going smoothly. It's about making sure that the student has the tools they need. So there it is: my process for conducting reference interviews at an academic library. Other academics, did I leave anything out that you usually do? That quote is from one of my favoritest books from when I was a kid: The Velveteen Rabbit. 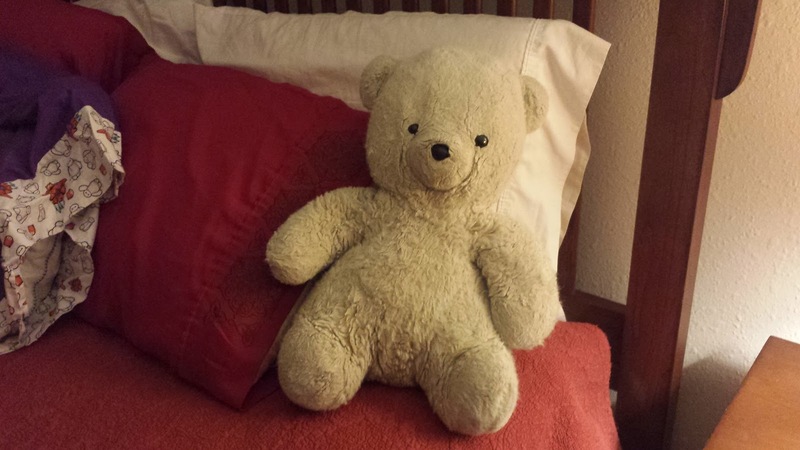 The story imbued all my toys, especially my stuffed animals, with their own lives and personalities and heartaches in a way in a way that never left me. I guess what I'm trying to tell you is that I stil have a large collection of stuffed animals in my life, ranging in age from 43 years to less than a month old. Some of them have long and detailed personal histories, but I'm still getting to know others. Here's a sampling of my stuffed friends along with a little bit about each of them. 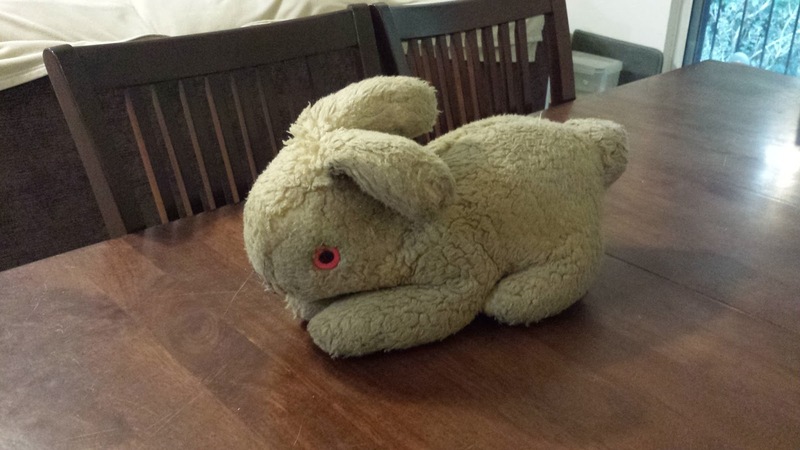 Dorothy the Bunny (with stuffies who have been loved as much as this lady has, it can be hard to tell the animal) has been in my life for as long as I can remember, although I know I haven't had her my entire life. I named her after Dorothy Gale... I was obsessed with The Wizard of Oz when I was a child, back when they'd play it on network television once per year. Also, I don't know if you can see from that picture, but Dorothy has eye shadow - a very young Jessica thought it would be fun. I bought Francis Bacon at a Goodwill near my undergraduate institution the day before classes started my freshman year in college. I vaguely remember thinking it was a funny and inappropriate name for a bear, since clearly Francis Bacon sounds like a name for a pig, but other than that I don't know why I named him after a philosopher I had never and still have never read. I used to make up stories of derring-do featuring Francis, but these days he just lives on my bed in comfortable semi-retirement. Chewbacca! What a Wookie! 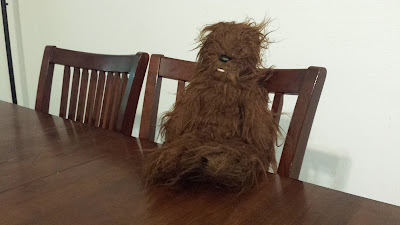 I've had my stuffed Chewie as long as I can remember, although I no longer have his bandoleer. Whenever anyone doubts my nerd credibility, I tell them about how I have a vintage Chewbacca stuffie that I've owned since it was brand new. 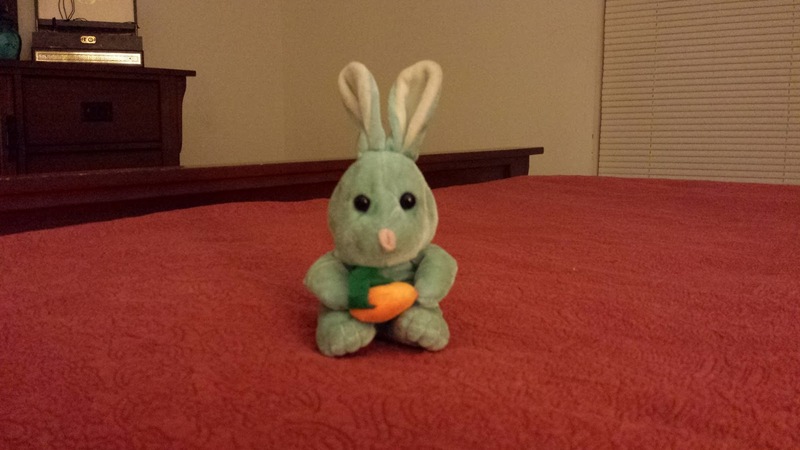 I found Mr. Bun, named after Susie Derkin's stuffie, in the middle of the parking lot of my apartment building. He'd obviously been run over by a car more than once, and he has a tear along the base of one of his ears as a result. I couldn't leave him there to get run over again. I just couldn't. At a former institution, there were a lot of faculty members who brought their dogs to work. Although I adored them all (and still do), I had a special relationship with Roy the Pug. Roy looooved me and, if I passed his domain without stopping to say hello, Roy would yell at the top of his lungs in that special high pitched pug yell. 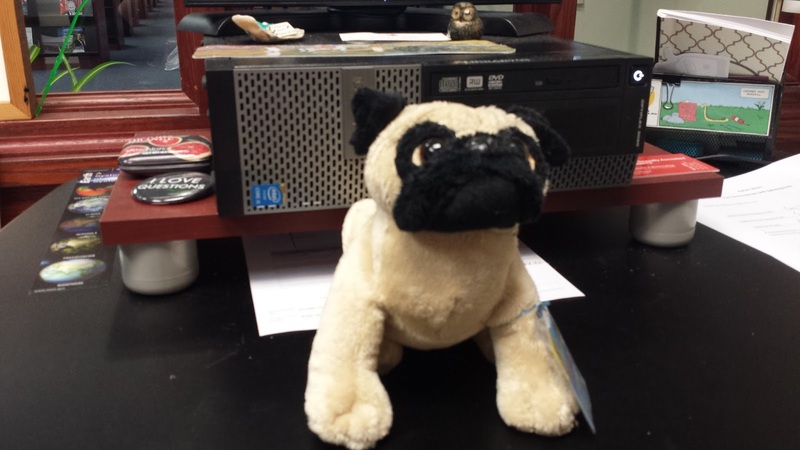 When I announced I was leaving that job to become a library director, Roy's human bought me a Webkinz pug who looks just like Roy, and I named the Webkinz pug Fake Roy. So, how about you? Any stuffed animals hanging around your home or office? A while back, during the first year of this blog's existence, I wrote about how I see librarianship as an asymptote. I never stop trying to improve my professional practice. The same thing, obviously applies to the library where I'm a director. That's why assessment is such a crucial part of my (and every librarian's) job. Lots of people act like "assessment" is a vulgar word, but if you approach it properly, it can be your friend. Identifying a Need: the beginning of any project is an assessment in and of itself. Paying attention to what's going on around you and noticing a need - whether in your work processes or to address community concerns - is making a judgement and therefore an assessment. Initiating the Project: gathering your stakeholders and discussing why the project is needed, even if it's just making your case to your boss, already has judgement involved as well. The issue here is making sure you do it intentionally. Stakeholders are people who will be effected by a project, and this is an important step of any effort. Sure, Project Awesome will make things smoother for your patrons, but how will it change the workflow of the person/people who manage your circulation desk or your website or whatever? Thinking that through is one of the most important assessments in any project and you can't do it alone. This is also where people typically establish a goal (why are you doing this project?) and desired outcomes (specific, measurable end results). Design/Development: Sure, sometimes the perfect solution presents itself, but just as often you need to design something to solve the problem. Keeping stakeholders involved so they can give you feedback is crucial. If something is complicated enough, you will want to test early iterations of the solution as well. That can be a pilot of your new instruction technique with a faculty member who trusts you or asking a friend who works at another library to try to find something on the test website. Take lots of notes here. Implementing the Project: This is rolling out your shiny new "thing". Taking notes about timing and people involved and such is important. How long did it take? Did people say anything about the "thing" while it was happening? Formal Assessment: Did you achieve your goals? Outcomes? Why/why not? This is writing the report for your director or reporting back to the instruction committee. This is also the point at which you try to figure out how to improve even further, which starts this list all over again since it's another example of identifying a need. The biggest thing is that it absolutely has to be a cycle. You never stop assessing just like you never stop trying to improve. And with a little luck (dragon), that's exactly what you'll do.